Each week, if I was well-behaved, I was rewarded with a trip to Bank Street Books. There, I could choose whatever I pleased, unless it was a toy. My mother always discouraged me from coveting the shiny toys sold in school book fairs and catalogs. Bookstores and book sales should be for books. No gimmicks. Though I longed for trading cards and jewelry kits, on some level, I knew she was right. There was nothing like discovering the new worlds of fiction (hopefully) every week. I’m not alone. Many New Yorkers, like myself, miss the corner stores, coffee shops, and Mom-and-Pop joints that maintained a neighborhood’s personality. The personal touch of employees that took the time to learn your preferences helped to establish micro-communities in a bustling city. In an environment deemed as unfriendly, New York City had and still has these gems between the department stores and banks. Independent bookstores are making a comeback across the country. Just this summer, retail sales at U.S. bookstores were up by 4.9 percent. During the “retail apocalypse” beginning in 2009, stores of all sizes feared that the Internet had taken over the bookselling industry. With tech-giants to compete with, I found it remarkable that people still enjoyed taking the time to peruse long aisles of manuscripts. However, for the next six years, the number of independent bookstores increased by thirty five percent. In New York City, sky-high rent sometimes precludes the underdogs from securing a spot. But once they nestle in, independent bookstores give a mark of authenticity and flair to otherwise heavily gentrified and “cookie-cutter” neighborhoods. Even if an independent bookstore is a chain, the personalized recommendations and warming ambiance break up the otherwise uniform urban landscape. My first ventures around the Upper West Side as a tween were quite intimidating. No one looked me in the eye, everyone doubted that I was without a parent, and few people offered guidance or information on anything, let alone reading material. Walking into my local Book Culture on 112th Street was a breath of fresh air and smelled better than the nearby stores. Workers asked me questions about my favorite books, and regulars gave me looks of disapproval or confusion at my choices. No longer looking for the alluring, shiny toys gave me perspective on what makes a quality bookstore experience. There were elements of belonging, shared interest, and a lack of uniformity that made the bookstore unique. Communal efforts made by independent bookstores do not go unnoticed and are cherished. These creative hubs bring about the opportunity for creative ideas: there are used book sales, charity drives, book-lover gear, memberships, children’s programming, and community events. Whereas a large chain may make you feel uncomfortable if one wants to read and sample different works, an independent bookstore staff and friendly regulars may offer recommendations. Kids will be drawn to thoughtfully organized children’s books. Hey, genres aren’t just for adults! There is a niche market of “make-believe books” at McNally Jackson. A personalized experience is associated with higher costs, but a good book recommendation should be as highly valued as a cup of coffee. You may even be able to get a cup while you're there! I found some rare perks at POWERHOUSE Arena, a bookstore in Brooklyn that features local authors almost nightly. Another bookstore, Bluestockings, also serves as an “activist center,” offering curated work about resistance, marginalized narratives, and commentary on current events. Part of the reason I love going into a place like Book Culture is the mystery books they have wrapped in the front of the store. 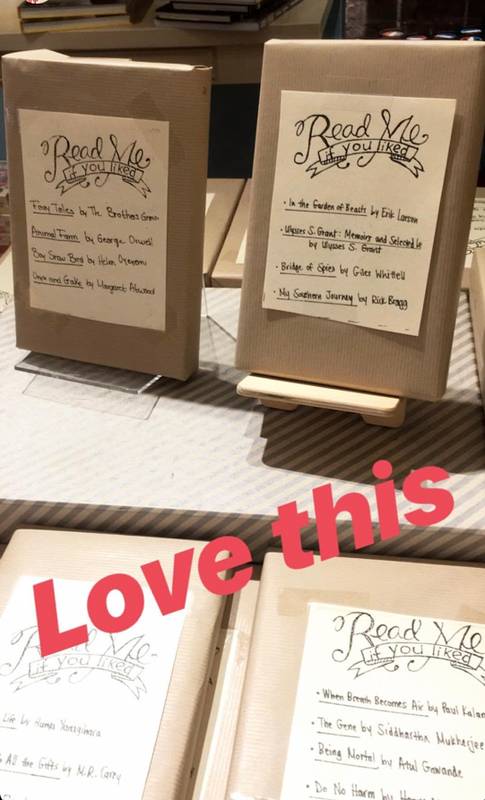 The hidden covers are alluring mysteries, with only the words “Read me if you like: *insert fabulous books here*.” Varied in genre and themes, the cardboard-wrapped suggestions were so cool that I decided to post selections on my Instagram story. Within minutes, I had notifications from friends and friends of friends asking me about where the books were being sold. I’m a sucker for whimsy, and purveyors of print do it best. These stores do not spurn technology. Often, they embrace it. McNally Jackson has two well-curated Instagrams, a Tumblr, and even a livestream for their events, where event books purchased during the livestream can ship free. Perspective, ambiance, and niche environments from stores are intimidating. Maybe you’re not the avid book fan, you want something quicker, or you feel too shy to interact with human beings. At times, we want to shop from our beds, rent a movie, or make a Barnes and Noble run. Unlike a retail store, independent bookstores open up a plethora of possibilities to book-lovers of the twenty-first century. When you enter an independent bookstore, you are not only buying a book: you are also paying for an experience, an ethos, and a community-driven mission.